September 5, 2017 thegrowthpartnership Redwitz News redwitz inc. 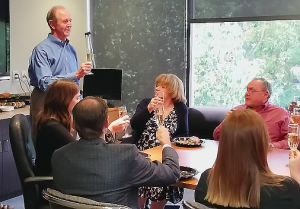 Celebrating the completed merger of Redwitz, Inc. and Link, Murrel and Company. We are happy to announce the merger of Redwitz, Inc. and Link, Murrel & Company. As of August 1, both organizations will be operating as one firm under Redwitz, Inc. We are also excited to share the news that of the successful merger of San Diego-based Stewart and Company to further complement and expand our financial services. From the onset of both merge processes, our goal has always been to provide the best service to you, our loyal clients. Today we are quite certain that we have accomplished this. “The opportunity to merge Link, Murrel & Company into what our firm is already doing is really exciting. We feel it’s going to provide our customers and clients with expanded financial services, as well as a number of other related services that they will benefit from,” explains Randy Redwitz, Senior Managing Principal of Redwitz, Inc.
For years Link, Murrel & Company has been extremely successful in its commitment to providing and maintaining the highest level of quality in all their professional services. Their major areas of focus include audit and attest services, tax services, client accounting services, management advisory services, forensic accounting/fraud audits and legal support services/litigation support. “We are looking forward to joining Redwitz, Inc. and expanding their capabilities. It’s an ideal situation where everybody will benefit,” says John Link of Link, Murrel & Company. With the merger of Link, Murrel & Company and Stewart & Company, all Redwitz, Inc. service offerings will now enhance and/or be made available to all our valued clients. In addition, these greater service offerings will bolster our capabilities through greater knowledge sharing and professional growth opportunities that have not existed in the past. We believe we have tremendously strengthened our firm to more completely service your needs. We greatly value our relationship with you and we strongly believe this merger will offer even greater value to you. If you have the slightest question or concern please reach out to us and we will be happy to give you more insight into the merger.